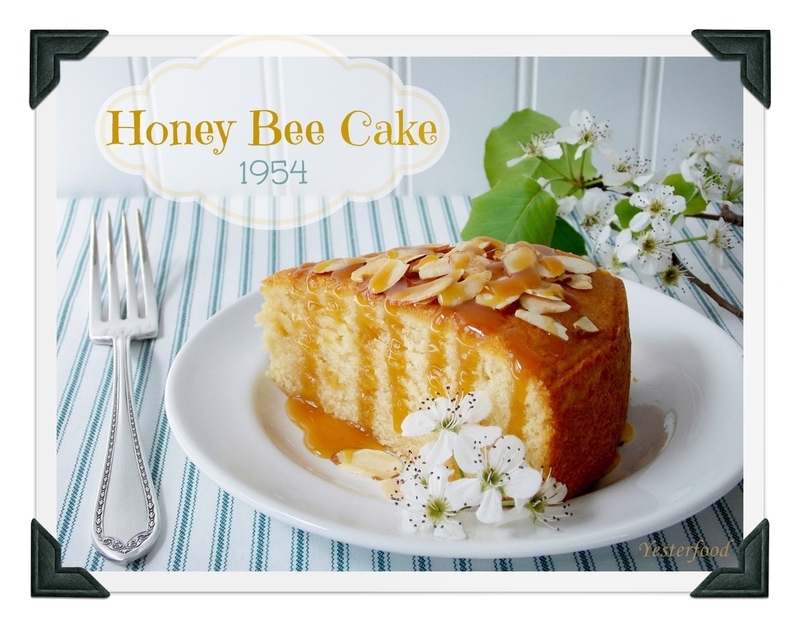 This great little cake from 1954 has a taste and texture similar to that of a rich pound cake, and is topped with a luscious caramel-y honey drizzle and toasted almonds. The cake stands beautifully on its own- it is dense, moist, and rich, and has a subtle honey flavor. The buttery honey caramel drizzle compliments and enhances the flavors of the cake, and the almonds provide a nice crunch. We really loved this cake! Preheat oven to 350 degrees. Spray a 9 inch cake pan with cooking spray, line the bottom with parchment paper, and spray the paper. In a bowl, sift together the flour, baking powder, and salt, then whisk the ingredients to mix well. In the bowl of a stand mixer fitted with a paddle attachment, combine the butter, sugar, honey, and vanilla on low speed until blended. Increase the speed to high and beat until very light and fluffy, about 7 minutes. Scrape sides of bowl frequently with a spatula. Blend in the eggs and egg yolk one at a time, adding the next one as soon as the previous one has disappeared into the batter. With the mixer on low speed, add the flour mixture in three parts, alternating with the buttermilk in two parts, beginning and ending with the flour. After each addition, mix until just barely blended and scrape the sides of the bowl. Fold the last of the flour in by hand with a spatula so that you don't overbeat the batter. Spread the batter evenly in the prepared pan, and rap the pan firmly on the counter to release any air bubbles. Place the pan in the center of the oven and bake for 45 minutes. Rotate the pan about halfway through baking time. The cake is done when it is firm on top, and a toothpick inserted in the middle of the cake will have a few moist crumbs attached. Cool the cake in the pan on a wire rack for about an hour. Remove cake from pan, remove the parchment paper, and let it finish cooling. Serve barely warm or at room temperature, sprinkled with toasted almonds and drizzled with honey caramel. While the cake is in the oven, you can make the drizzle. Combine the honey, brown sugar and butter in a small saucepan, bring to a full boil over medium heat, stirring very frequently. Boil for 1 minute, stirring constantly. Serve warm or at room temperature. The next day it made the best strawberry shortcake! oooh! It looks beautiful and delicious! I love how you always give us different serving options! You are so creative and talented! :) Great pictures as well! Your pictures are gorgeous! Even without the brown sugar honey glaze it looks perfect! I didn't taste it without the glaze, but now I'm starting to wish I had. Lovely! I can't find any other words to describe your cake! Love the leftover idea! Beautiful photos! I love that you topped each slice individually (and so perfectly!). We just found your blog. We have some family favorites that are passes down too. I absolutely love your cake, and your accompanying photos are amazing - so talented! I love the idea of letting the glaze caramelize and will have to try that next time. ciao Joy ! wow what settings for this wonderful cake ! great ! AWESOME!!!! as usual! Lovely pictures, I especially love that first one! I know that I love the cake plain too! Your cake looks wonderful and the strawberries look perfect. Beautiful desert. We have a link party called Wednesdays Adorned From Above Blog Hop and would love to have you share this and any other posts with everyone. It runs from Tuesday night through midnight Sunday. Here is the link to the party. Thank you, and thanks so much for the invitation! Goodness! looks so delish! My MIL makes a cake similar to this that we have nicknamed "messy cake" because she does put her "drizzle" on it, and as it soaks in, it's SO good. But I like the option for the individual slices as well, which is a fantastic idea. Thanks for sharing your recipe! This is my kind of cake, Joy! It look absolutely lovely and sounds delicious. I like your idea of putting the drizzle on individual slices too. I've pinned your recipe and I hope to try it soon. What a gorgeous and yummy looking cake! I love the drizzle that you made. This cake looks delicious. It would be a shame not to share it. So I'll be sharing in on my FB page. I found you on Foodie Friends Friday. Nicky, thank you very much for the visit and for the share!! I will visit you! What a delicious and gorgeous looking cake!! What a beautiful Cake! I have pinned you! I found this post on I'm Loving it Friday's! Oh my little bear has been asking about making a honey cake... I may have just found my Easter Dessert! This is a fabulous cake that we will just love. It will be perfect for the spring season. Hope you are having a great weekend and thank you so much for sharing with Full Plate Thursday. Fantastic photos and great recipe! I bet the buttermilk gives this cake a really nice texture and I can't wait for the chance to make some for myself! This cake looks so beautiful and sounds absolutely delicious! I love anything with honey, and this sounds like a wonderful dessert! I'm laughing at myself right now. Have been seeing Honey Bee Cake all over the place and didn't realize an entire group was making it. It all makes sense now! I think the drizzle looks great--almost like the stripes on a bee. Thank you for linking w/ See Ya in the Gumbo this week. Lol! I didn’t think about the stripes of drizzle looking like the stripes on a bee- I love that! Thanks for a great party! Hope you have a good week!! This looks so yummy. I can't wait to try it! It looks so good! Reminds me of a cake my grandmother used to make. Thanks for sharing with Foodie Friends Friday! That honey caramel sauce looks to die for! - great photos! Hi Joy, I saw this on Marvelous Mondays. It looks fantastic! Keep up the good work! Wow, this looks amazing, and your photography is beautiful! This looks delicious, I can't wait to try it :-D Pinning it to my baking board now! Thanks for posting. This cake looks fantastic and if a cake can be comfort food, this is it. Thank you for sharing. Coming to you from the Hearth and Soul Blog Hop. Absolutely LOVE baking with honey....what a fabulous recipe!! Looks delish! Thank you for sharing at Tuesday Trivia this week at Memories by the Mile. You are featured on today's post. I absolutely am in love with this cake and your blog. It's all about the memories. Wanda Ann, that means so much to me- many, many thanks! Thanks for the feature, and thank you for coming by! I wish you and yours a beautiful Easter! This looks delicious, Joy! AND with a Honey Caramel Drizzle :-) Thank you for sharing at ALL MY BLOGGY FRIENDS ! This looks delicious! Pinned to my food board. Thanks for sharing at Marvelous Mondays! Joy, this looks amazing and so delicious! YUM Thank you so much for sharing at A Bouquet of Talent. Have a Happy Easter! Absolutely gorgeous! I've pinned it - this would make a lovely dessert for Easter dinner. Thank you for pinning, Alea, and for coming by!! You were featured at Freedom Fridays Blog hop!! I just pinned this and posted it on Facebook:)) Thank you for sharing at Freedom Fridays!! Evelyn, this just makes my day- thank you SO very much! Just stopping by to let you know that Carrie and I will be featuring this at tomorrow night's Marvelous Mondays party! Have a great weekend! Thank you for entering this recipe at the Top Recipe Showcase for March 2013. This looks so good. I wish I was as creative as you. Your pics of this cake are all so wonderful! I love the idea of serving with the sauce and nuts separate. Yum! And this cake with the honey drizzle? Definitely planning on trying it soon! SOOO beautiful!! And that honey caramel drizzle sounds AMAZING!! Thanks for linking this up at the last Weekend Kitchen Party...hope to see you this weekend too! This looks beautiful! I love honey and I LOVE cooking with honey. Most recently I made honey and almond biscotti (http://susansumptuousuppers.wordpress.com/2013/04/07/honey-and-almond-biscotti/) but i have bumble bee biscuits that I make too, and I've been toying with the idea of making honey toffees. I also plan to cure my next batch of home made bacon in honey. Keep up the good work! Lol! You are going to be a lot of fun, I can tell!! Thank you for such a day-brightener! Your Honey Bee Cake makes me happy! I made this for Easter and it was a big hit! Holly, I am thrilled that you made my cake and that it was a hit! Thank you for letting me know! And thank you for hosting the always-wonderful Oh What a Happy Day Party! Woman, your cakes will be the death of me!! THIS from the girl who created "Banana Cake with Almond Cream Cheese Frosting", lol!! :) I'm so glad you visited! Looking for guest posts for my blog in September. I'm doing a series celebrating "National Honey Month" and would love your bee-inspired crafts, projects, honey-laden recipes, etc.... Anything and everything related to BEES..... (Hey, I don't need much reason to throw a party!) Please contact me if you'd be interested in guest posting!!!! i made it yesterday. My parents and my brother loved it. Tastes sooo good!! We got a beehive last year. This will be the first year to get honey. Always on the lookout for honey recipes. Pinned to try. This sounds fantastic! Pinned to try later! Stopping by Lamberts Lately! This sounds wonderful!!! And a honey, brown sugar and butter drizzle... holy moly! We will have to make this for sure! That looks amazing! Can you ship me a piece, please? Lol. Thanks for sharing at Thursday Favorite Things. I hope you will join us again next Thursday! Joy, that looks absolutely beautiful...and yummy of course too! If you have a moment, I love it if you would share it with us at #FoodieFriDIY too! YUM! This sounds and looks delicious Joy. I will be decorating my table and kitchen in a bee theme for May. I certainly need to make this cake! Thanks for sharing with SYC. Hi Joy!! That looks absolutely amazing!! Great dessert!! Thanks for Sharing on My 2 Favorite Things on Thursday!! Hope to see you again tomorrow...love your stuff!! Pinned! I have been out of town all weekend attending a Women's Retreat but wanted to stop by to give you the good news. Congratulations,your recipe is a Top Ten this week on Full Plate Thursday. Hope you have a great week and enjoy your new Red Plate!